Liver X receptors (LXRs) exert key functions in lipid homeostasis and in control of inflammation. In this study we have explored the impact of LXR activation on the macrophage response to the endogenous inflammatory cytokine IFN-γ. Transcriptional profiling studies demonstrate that ∼38% of the IFN-γ–induced transcriptional response is repressed by LXR activation in macrophages. LXRs also mediated inhibitory effects on selected IFN-γ–induced genes in primary microglia and in a model of IFN-γ–induced neuroinflammation in vivo. LXR activation resulted in reduced STAT1 recruitment to the promoters tested in this study without affecting STAT1 phosphorylation. A closer look into the mechanism revealed that SUMOylation of LXRs, but not the presence of nuclear receptor corepressor 1, was required for repression of the NO synthase 2 promoter. We have also analyzed whether IFN-γ signaling exerts reciprocal effects on LXR targets. Treatment with IFN-γ inhibited, in a STAT1-dependent manner, the LXR-dependent upregulation of selective targets, including ATP-binding cassette A1 (ABCA1) and sterol response element binding protein 1c. Downregulation of ABCA1 expression correlated with decreased cholesterol efflux to apolipoprotein A1 in macrophages stimulated with IFN-γ. The inhibitory effects of IFN-γ on LXR signaling did not involve reduced binding of LXR/retinoid X receptor heterodimers to target gene promoters. However, overexpression of the coactivator CREB-binding protein/p300 reduced the inhibitory actions of IFN-γ on the Abca1 promoter, suggesting that competition for CREB-binding protein may contribute to STAT1-dependent downregulation of LXR targets. The results from this study suggest an important level of bidirectional negative cross-talk between IFN-γ/STAT1 and LXRs with implications both in the control of IFN-γ–mediated immune responses and in the regulation of lipid metabolism. Nuclear receptors constitute a family of ligand-dependent transcription factors that regulate diverse aspects of development and homeostasis (1). Liver X receptors (LXRs) represent a subset of the nuclear receptor superfamily that is regulated by oxidized forms of cholesterol (oxysterols) and intermediary products of the cholesterol biosynthetic pathway (2, 3). Two LXR isoforms exist, namely LXRα (NR1H3) and LXRβ (NR1H2), which are encoded by distinct genes. LXRs form obligate heterodimers with retinoid X receptors (RXRs), which are themselves members of the nuclear receptor superfamily that can be regulated by 9-cis retinoic acid and long chain polyunsaturated fatty acids (reviewed in Ref. 4). In the absence of ligands, LXR/RXR heterodimers actively repress transcription of target genes through the recruitment of nuclear receptor corepressors (5). Upon binding either LXR or RXR ligands, these corepressors are released in exchange for nuclear receptor coactivators, resulting in transcriptional activation. At the physiological level, LXRs play important roles as integrators of metabolic and inflammatory signaling (reviewed in Ref. 6). Upon activation by oxysterols, LXRs activate the expression of genes involved in lipid homeostasis, glucose metabolism, macrophage survival, and phagocytosis of apoptotic bodies (reviewed in Ref. 7). Examples of LXR targets involved in lipid homeostasis are the cholesterol transporters ATP-binding cassette (ABC)A1 (8) and G1 (9), the inducible degrader of the low-density lipoprotein receptor (10), and sterol response element binding protein 1c (SREBP1c), which mediates transcriptional regulation of de novo lipogenesis (11). In addition to the positive control of target gene expression, LXR activation inhibits the expression of a number of molecules induced by LPS through a process known as transrepression. These molecules include proinflammatory mediators, including NO synthase 2 (NOS2), cytokines such as IL-1β, and chemokines such as MCP-1 (12). Recent studies have shown that the LXR agonist GW3965 is also capable of inhibiting the mRNA expression of IFN regulatory factor (Irf)1, Tnfa, and Il6 in astrocytes stimulated with IFN-γ (13). In this work we have explored global effects of LXR activation on the macrophage response to IFN-γ. Microarray analysis was performed to characterize IFN-γ–induced transcriptional responses subject to downregulation by LXR activation. Both LXRα and LXRβ have the capability to repress the expression of several genes validated in macrophages. The LXR agonist TO901317 (T1317) also mediated inhibitory effects on selected IFN-γ–induced genes in the CNS. Although LXR activation did not affect STAT1 phosphorylation, chromatin immunoprecipitation studies revealed reduced STAT1 binding to the promoters analyzed in this study. SUMOylation of LXRs was required to inhibit the STAT1-induced activity of the Nos2 promoter. We also observed that IFN-γ signaling interfered negatively with the capability of LXRs to upregulate selective target genes. These effects were mediated by STAT1 and did not involve reduced recruitment of LXR/RXR to target gene promoters. The results in this study strongly suggest reciprocal negative cross-talk between IFN-γ/STAT1 and LXRs with consequences in the control of IFN-γ–mediated immune responses and in the regulation of lipid metabolism. Recombinant murine IFN-γ was purchased from Pierce Biotechnology (Rockford, IL). T1317 was purchased from Cayman Europe (Tallinn, Estonia). GW3965 was purchased from Tocris (Bristol, U.K.). 25-Hydroxycholesterol (25-HC) and desmosterol were obtained from Santa Cruz Biotechnology (Santa Cruz, CA). 24,25-Epoxycholesterol and LPS were purchased from Sigma-Aldrich (St. Louis, MO). Recombinant murine IL-4 and IL-10 were purchased from PeproTech (Rocky Hill, NJ). Recombinant human TGF-β was obtained from eBioscience (San Diego, CA). Acetylated low-density lipoprotein (acLDL) was purchased from Biotrend (Köln, Germany). Bone marrow–derived macrophages were obtained from 6- to 10-wk-old C57BL/6 mice (Harlan, Indianapolis, IN) as described (14). Bone marrow precursors were cultured in DMEM (PAA Laboratories, Velizy-Villacoublay, France. ), supplemented with 20% heat-inactivated FCS (PAA Laboratories) and 30% L cell conditioned medium as a source of M-CSF. Primary microglia were obtained from the brain cortex of neonatal mice as described (15), with some modifications. Briefly, cortex was homogenized and incubated in tissue culture plates in the presence of DMEM/10% heat-inactivated FCS. Confluent mixed glial cultures were subjected to mechanical detachment and microglia were selected by adherence to plastic flasks for 3 h. These microglial cultures were >95% pure as measured by FACS analysis using FITC-conjugated anti-mouse F4/80 (eBioscience, San Diego, CA). Raw264.7 macrophages (American Type Culture Collection) were cultured in DMEM/10% FCS. Foam cells were generated by incubating bone marrow–derived macrophages with acLDL (10 μg/ml) for 33 h. Confirmation of foam cell formation was performed by microscopy after staining the cells with Oil Red O.
LXR-deficient mice (8, 16) were donated by Dr. David Mangelsdorf (University of Texas Southwestern Medical Center, Dallas, TX). STAT1-deficient mice were provided by Dr. Anna Maria Planas (Institut d’Investigacions Biomèdiques August Pi i Sunyer, Barcelona, Spain). Total RNA was extracted using TRIzol (Invitrogen, San Diego, CA). Hybridization targets were prepared from 25 ng total RNA using an isothermal amplification SPIA biotin system v2 (NuGEN Technologies, San Carlos, CA). cDNA (2.2 μg) was hybridized to each GeneChip Mouse Genome 430 2.0 Array (Affymetrix, Santa Clara, CA). GeneChips were scanned in a GeneChip Scanner 3000 (Affymetrix). CEL files were generated from DAT files using GeneChip operating software (Affymetrix). Expression estimates were calculated from probe intensities using the well-behaved estimates of differential gene expression plus probe-level p values plus extensible quantile scaling algorithm (17) and represented as log2 values. For each treatment, fold expression values were calculated (in log2 scale) after subtraction of the expression values obtained from control cells. Average values of fold expression data from two independent experiments were used for further analysis. Heat maps were produced with CIMminer developed by the Genomics and Bioinformatics Group (Laboratory of Molecular Pharmacology, Center for Cancer Research, National Cancer Institute). Microarray data have been deposited at the MIAMExpress database (http://www.ebi.ac.uk/miamexpress) with accession no. E-MEXP-3871. Lists of genes obtained from microarray analysis were associated to biological process annotations as defined by the Gene Ontology Consortium (GO) (18). DAVID bioinformatic resources (19, 20) were used to search for statistically significant enrichment of functional categories. Cells were washed twice in cold PBS and total RNA was extracted using TRIzol (Invitrogen) as recommended by the manufacturer. For cDNA synthesis, 1 μg RNA was subjected to reverse transcription using Moloney murine leukemia virus reverse transcriptase RNase H Minus, Point Mutant, oligo(dT)15 primer, and PCR nucleotide mix (Promega, Madison, WI). Quantitative real-time PCR (qRT-PCR) was performed using the Power SYBR Green reagent kit (Applied Biosystems, Foster City, CA) following the manufacturer’s recommendations. The sequence of primers used for qRT-PCR analysis are shown in Table I. Annealing for all primers was performed at 60°C for 30 s. Real-time monitoring of PCR amplification was performed using the ABI Prism 7900 sequence detection system (Applied Biosystems). Data were expressed as relative mRNA levels normalized to ribosomal L14 expression. Statistical analysis was performed using a two-tailed Student t test. Raw264.7 cells were cotransfected with 0.5 μg plasmid containing a luciferase reporter under the control of the murine Nos2 promoter (21), Renilla expression plasmid (10 ng), and 0.5 μg pcDNA3 expressing either LXRα, LXRβ, or the mutant forms lacking two SUMO acceptor sites, LXRα K328R/K434R or LXRβ K410R/K448R. Control cells were transfected with the luciferase- and Renilla-expressing plasmids and 0.5 μg empty pcDNA3. In another set of experiments, Raw264.7 cells were cotransfected with 0.5 μg plasmid containing a luciferase reporter under the control of the murine ATP-binding cassette A1 (Abca1) promoter (22) and 0.5 μg pcDNA3 plasmids expressing LXRα, RXRα, or LXRα K328R/K434R. Either 10 ng β-galactosidase expression plasmid under the control of the β-actin promoter or 10 ng Renilla expression plasmid was used for normalization purposes. Control cells were transfected with the luciferase- and β-galactosidase–expressing plasmids and 1 μg empty pcDNA3. All cells were transfected using SuperFect transfection reagent (Qiagen, Düsseldorf, Germany) and following the manufacturer’s recommendation. After transfection, the cells were incubated with medium containing LXR agonists and/or IFN-γ. The cells were analyzed for firefly luciferase and Renilla activity by using Promega Dual-Luciferase reporter assay system on a TD-20/20 luminometer (Turner Designs, Sunnyvale, CA). β-galactosidase activity was measured by using a commercial kit from Applied Biosystems and an Infinite M200 luminometer (Tecan, Männedorf, Switzerland). The levels of luciferase activity were normalized to those of Renilla or β-galactosidase activity. We used small interfering RNA (siRNA) to block the expression of nuclear receptor corepressor 1 (NCOR1) (ON-TARGETplus SMARTpool; Dharmacon, Lafayette, CO). Control siRNAs were designed against GFP (5′-GGCUACGUCCAGGAGCGCACC-3′) (Eurofins). siRNAs were transfected into macrophages by using SuperFect (Qiagen) following the manufacturer’s recommendations. Briefly, Raw264.7 cells (2 × 105 cells in 400 μl DMEM) were incubated with 1 μM siRNA and 7.5 μl SuperFect for 2 h. The medium was then replaced by DMEM/2% FCS with and without agonists. Macrophage activation was carried out at least 24 h after transfection. The efficiency of Ncor1 silencing, measured by qRT-PCR, was 67% (data not shown). Cells were washed twice in cold PBS and lysed on ice with lysis solution (1% Triton X-100, 10% glycerol, 50 mM HEPES [pH 7.5], 250 mM NaCl, protease inhibitors, 1 mM sodium orthovanadate). Insoluble material was removed by centrifugation at 13,000 × g for 8 min at 4°C. Cell lysates (50–100 μg) were boiled at 95°C in Laemmli SDS-loading buffer and separated by SDS-PAGE and electrophoretically transferred to nitrocellulose membranes (Hybond ECL; GE Healthcare Europe, Munich, Germany). Membranes were blocked in 5% milk in TBS/0.1% Tween 20 and then incubated with primary Abs. To study the phosphorylation of STAT1 we used anti–phospho-STAT1 (Ser727) (Cell Signaling Technology, Beverly, MA) and anti–phospho-STAT1 (Tyr701) Abs (Invitrogen). Total STAT1 expression was determined by using an anti-STAT1 p84/p91 Ab (Santa Cruz Biotechnology). Abs to measure ABCA1 expression were purchased from Novus Biologicals (Littleton, CO) and anti-NOS2 Abs were obtained from Santa Cruz Biotechnology. To check for protein loading and transfer, we used anti-mouse β-actin (Sigma-Aldrich) or anti–α-tubulin (Invitrogen) Abs. In general, membranes were washed three times in TBST and then incubated for 1 h with peroxidase-conjugated secondary Abs. Anti-mouse IgG was obtained from Sigma-Aldrich, whereas anti-rabbit IgG was purchased from Jackson ImmunoResearch (Pennsylvania, PA). After three washes of 15 min with TBST, ECL detection was performed (GE Healthcare Europe) and the membranes were exposed to x-ray films (Fujifilm, Tokyo, Japan). The chromatin immunoprecipitation (ChIP) assay was conducted as previously described (5). Briefly, 20 × 106 macrophages were fixed with 1% formaldehyde. Cross-linked adducts were resuspended and sonicated, resulting in DNA fragments of 200–1200 bp. Immunoprecipitation was performed by using 1 μg rabbit anti–STAT1 p84/p91 Ab (Santa Cruz Biotechnology), 1.5 μg rabbit anti–LXR Abs (generated as described in Ref. 23), or 1.5 μg rabbit anti–RXRα Abs (Santa Cruz Biotechnology). Rabbit IgG (Sigma-Aldrich) was used as a control for nonspecific binding. Protein-bound, immunoprecipitated DNA was reverse cross-linked at 65°C overnight and then purified by using a PCR purification kit (Qiagen). One microliter of a 60 μl DNA extraction volume was used for qRT-PCR analysis. The primers shown in Table II were used to amplify the genomic regions analyzed in this study. For Nos2 and Cxcl11, we designed primers in the vicinity of the IFN-γ activation site (GAS) element within the promoter region of these genes. For Abca1, the primers were designed around the LXR response element (LXRE) at position −65 in the Abca1 promoter (24). For Srebp1c, the primers surround the two LXREs located at positions −249 and −200 from the transcriptional start site of Srebp1c (25). In the case of ATP-binding cassette G1 (Abcg1), the primers were designed to recognize an intronic enhancer containing an LXRE located at +16,098 from the Abcg1 transcriptional start point (26). Binding of at least LXRβ to these genomic regions has been demonstrated by ChIP sequencing (27). Bone marrow–derived macrophages were loaded during 24 h with 50 μg/ml [3H]cholesterol-labeled acLDL (4 μCi/ml) in DMEM/5% heat-inactivated FCS and 100 μg/ml penicillin/streptomycin in the presence or absence of IFN-γ (5 ng/ml). The loading medium was removed and the cells were equilibrated in DMEM/0.2% lipid-free BSA (Sigma-Aldrich) for 2 h. After that, the medium was removed and the cells were maintained during 24 h in DMEM with or without IFN-γ and/or T1317 (1 μM). Cellular cholesterol efflux was induced by adding 20 μg/ml lipid-free apolipoprotein A-I (apoAI; Sigma-Aldrich) during the last 4 h of the assay. At the end of the efflux period, the medium was recovered and the cells were lysed in 0.5 N NaOH. Radioactivity counts were determined both in the medium and in the cellular fraction by using a 1500 Tri-Carb Packard scintillation counter. The percentage of cholesterol efflux was calculated as 100 × [(cpm in medium)/(cpm in medium + cpm in cellular fraction)]. Each point was performed in triplicate, and the results were expressed as the mean ± SD. Statistical analysis was performed using a Student t test. Male C57BL/6 mice (Charles River) were housed with access to food and water ad libitum in a colony room kept at 19–22°C and 40–60% humidity, under a 12-h light/dark cycle. All procedures were performed in compliance with the National Institutes of Health Guide for the Care and Use of Laboratory Animals, and approved by the Local Animal Care Committee of Universitat de Barcelona (99/01) and Generalitat de Catalunya (99/1094). IFN-γ–induced neuroinflammation was carried out as described with some modifications (28–30). Ten-week-old mice were subjected to injection of IFN-γ (20 ng in 10 μl PBS) in the ventricular region (third ventricle) of the brain at the following coordinates relative to bregma: anterior–posterior, −0.3 mm; lambda, 0.0 mm; and 3.0 mm below the dural surface with the incisor bar at 3 mm above the interaural line. Controls were injected with vehicle (PBS). LXR activation was induced by i.p. injection of T1317 (10 mg/kg) at 2 d, 1 d, and 4 h prior to the intraventricular injection of IFN-γ. Controls were injected i.p. with vehicle (DMSO in PBS). Mice were sacrificed 24 h after the IFN-γ or PBS injection and brains were dissected out. Total RNA was extracted from each hemisphere (without the olfactory bulb) using TRI Reagent (Sigma-Aldrich) as recommended by the manufacturer. Statistical analysis was performed using the Wilcoxon/Mann–Whitney U test. The first aim of this study was to explore whether, and to what extent, the macrophage response to IFN-γ is negatively affected by LXR activation. Expression profile experiments were performed in bone marrow–derived macrophages stimulated with IFN-γ for 6 h in the presence or absence of the synthetic LXR agonist GW3965. The expression of >1000 genes was upregulated by IFN-γ (>2-fold induction). Approximately 38% of these upregulated genes underwent ≥30% repression upon LXR activation (Fig. 1A). The list of genes induced by IFN-γ and consistently downregulated by GW3965 was subjected to GO analysis. 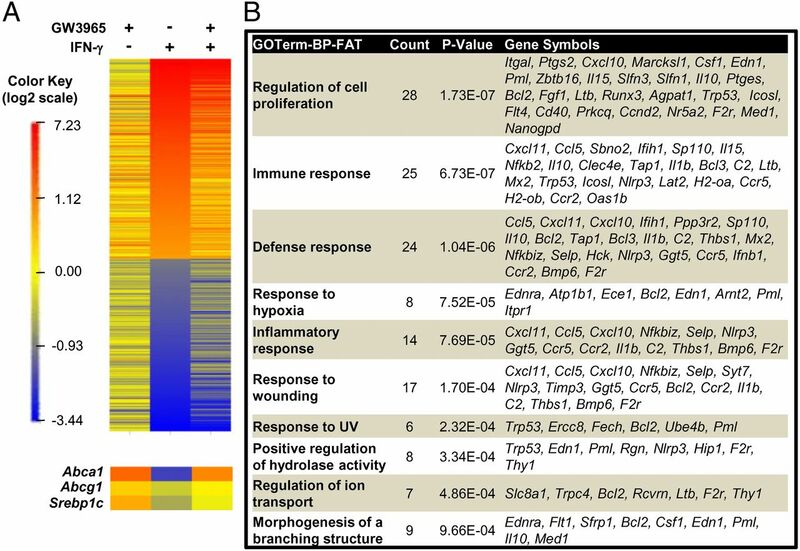 The use of DAVID bioinformatic resources showed statistically significant enrichment of several functional categories among the list of genes transrepressed by GW3965, including immune and inflammatory responses, the regulation of cell proliferation, and the responses to wounding and hypoxia (Fig. 1B). LXR activation inhibits 38% of the macrophage transcriptional response to IFN-γ. (A) Global effects of the LXR agonist GW3965 on IFN-γ–stimulated gene expression were evaluated using gene expression arrays. Macrophages were preincubated with GW3965 (2 μM) or vehicle for 18 h and then stimulated or not with IFN-γ (5 ng/ml) for 6 h. Control cells were treated with vehicle for the entire length of the experiment. For each treatment, average fold expression values (over control cells) from two independent experiments were calculated (log2 scale). The genes that underwent upregulation (equivalent to ≥2-fold) or downregulation (≥2-fold) by IFN-γ were selected to build a heat map. Positive (orange) and negative (blue) changes in gene expression over control cells are visualized for each treatment. As a control for LXR activity, the fold expression values of three well-characterized LXR target genes, namely Abca1, Abcg1, and Srebp1c, are shown in the lower panel. (B) GO analysis of the list of genes upregulated by IFN-γ and transrepressed by GW3965 shows enrichment (>1.5) of several biological processes. Several genes involved in the immune response were selected from the expression profiling studies and further validated (Fig. 2). We also included the proinflammatory mediator NOS2 in subsequent studies, as it is a well-described LXR transrepression target in experiments performed with LPS (31). 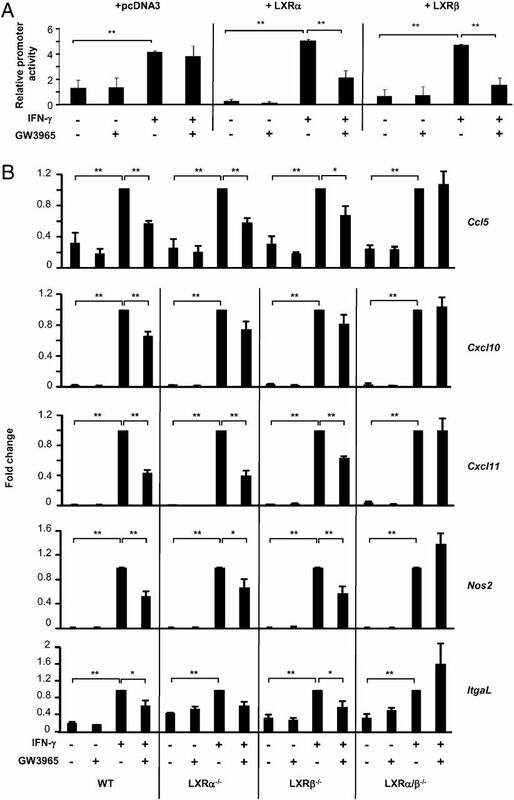 GW3965 inhibited, in a dose-dependent manner, the IFN-γ–induced mRNA expression of several proinflammatory mediators, including the chemokines Ccl5 and Cxcl11, the adhesion molecule integrin α L (ItgaL), Nos2, and PG synthase 2 (Fig. 2A). 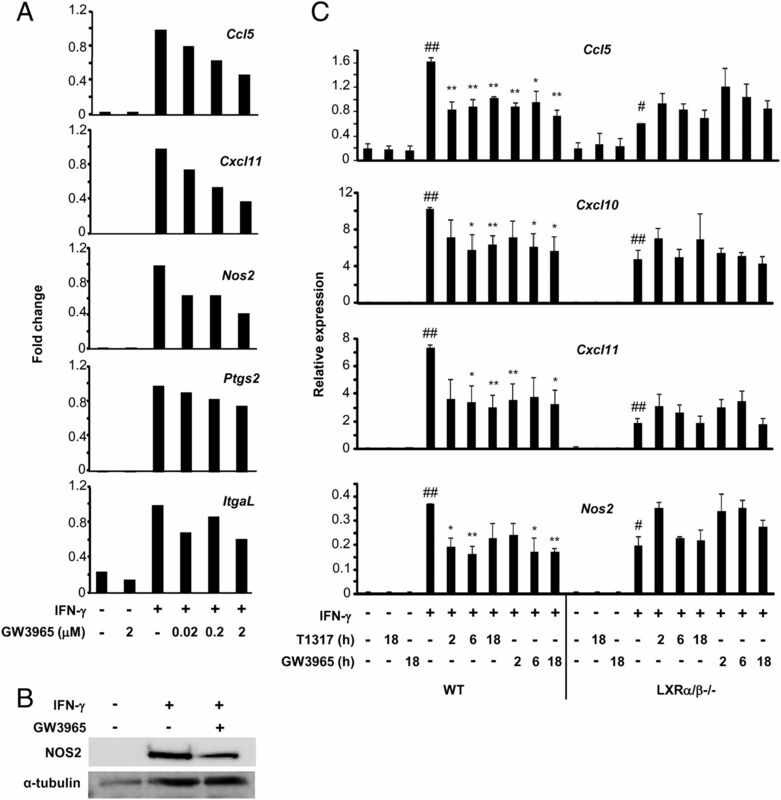 Western blot analysis confirmed the repression of NOS2 at the protein level as well (Fig. 2B). To further validate our observations, time course experiments were performed with the LXR agonists T1317 and GW3965 in wild-type (WT) and LXR-deficient macrophages (Fig. 2C). 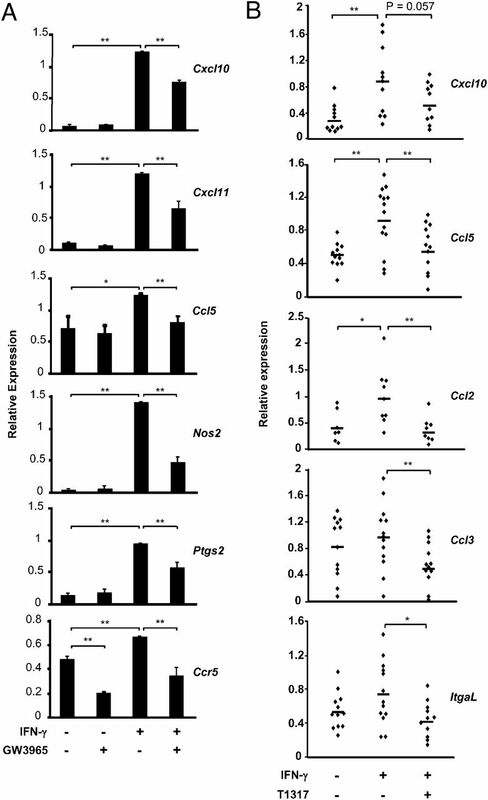 A short preincubation time with LXR agonists resulted in maximal repression of Ccl5 and Nos2, which was maintained over the course of the experiment, whereas prolonged incubation with agonists resulted in increased repression of Cxcl10 and Cxcl11. No repression of these genes was observed in LXR-deficient cells. Dose and time requirements for LXR-mediated inhibition of IFN-γ–dependent responses. (A) GW3965 downregulated the expression of IFN-γ–induced genes in a dose-dependent manner. Bone marrow–derived macrophages were preincubated with different doses of GW3965 for 18 h and then stimulated with IFN-γ (5 ng/ml) for 6 h. Total RNA was isolated and gene expression was analyzed by qRT-PCR. Relative expression values were normalized to the expression levels of ribosomal L14 and represented as fold change over the levels of expression in IFN-γ–treated cells. Similar results were obtained in two independent experiments, and a representative experiment is shown here. PTGS2, PG synthase 2. (B) Macrophages were preincubated with GW3965 (2 μM, 18 h) and then stimulated with IFN-γ for 24 h. NOS2 expression was evaluated by Western blotting. The expression of α-tubulin was measured as a control for protein loading and transfer. (C) Macrophages derived from WT and LXR-deficient (LXRα/β−/−) mice were preincubated with T1317 (2 μM) or GW3965 (2 μM) during the indicated periods of time and then stimulated with IFN-γ for 6 h. Gene expression was evaluated as described in (A). Graphics show mean data ± SEM; n = 3. #p < 0.05, ##p < 0.01 versus nonstimulated cells; *p < 0.05, **p < 0.01 versus IFN-γ–treated cells (in the absence of LXR agonist). The inhibitory effect of LXR activation on IFN-γ mediated gene expression was also observed in primary microglia, which are specialized macrophages from the CNS (Fig. 3A). Production of IFN-γ contributes to the initiation and amplification of local immune responses, potentially leading to neurodegeneration in the CNS (32–34). We used a murine model of acute response to IFN-γ based on injection of this cytokine in the ventricular region of the brain. Increased expression of several molecules associated to an inflammatory profile, namely Cxcl10, Ccl5, Ccl2, Ccl3,and ItgaL, was detected in the brain after the injection of IFN-γ, which was inhibited by pretreatment with T1317 (Fig. 3B). 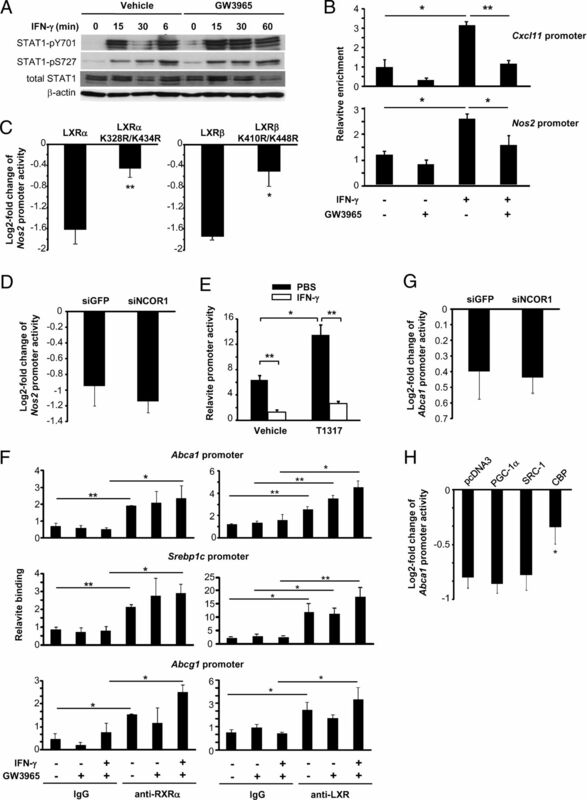 These results indicate that LXR agonists mediate inhibition of IFN-γ–induced responses both in vitro and in a model of acute neuroinflammation in vivo. LXR agonists mediate transrepression of IFN-γ–induced genes in primary microglia and in mouse brain. (A) GW3965 downregulated the expression of genes induced by IFN-γ in microglia. Primary microglia were preincubated with GW3965 (2 μM) for 18 h and then stimulated with IFN-γ (5 ng/ml) for 6 h. PTGS2, PG synthase 2. (B) Brain inflammation was induced by intracerebroventricular injection of IFN-γ. Control mice were injected with vehicle (PBS). LXR activation was induced by i.p. injection of T1317 (10 mg/kg) at 2 d, 1 d, and 4 h prior to the intraventricular injection of IFN-γ. Control animals received i.p. injections of vehicle (DMSO in PBS). In (A) and (B), mRNA levels of proinflammatory mediators were determined using qRT-PCR. In (A), the results represent mean values of relative expression ± SEM; n = 4. In (B), relative expression values (♦) are shown for each animal of study. Mean values for each group of animals are represented as horizontal bars. Each group contained at least seven animals. A Wilcoxon/Mann–Whitney U test was used to determine statistical significance. In (A) and (B), *p < 0.05, **p < 0.01. The contribution of LXR isoforms to the inhibitory effects on IFN-γ signaling was evaluated in Raw264.7 macrophages transfected with a luciferase reporter gene under the control of the Nos2 promoter (Fig. 4A). Under our experimental conditions, LXRα and LXRβ are expressed at low levels in Raw264.7 macrophages (data not shown). Plasmids overexpressing LXRα or LXRβ were cotransfected with the luciferase reporter. Treatment with GW3965 led to repression of IFN-γ–induced Nos2 promoter activation upon overexpression of exogenous LXRα or LXRβ, which indicates that both isoforms have the capability to transrepress the Nos2 promoter. We next evaluated the capability of LXR agonists to inhibit the response to IFN-γ in macrophages deficient for LXRα or LXRβ (Fig. 4B). In general, for most of the genes examined, both isoforms contributed partially to transrepression in agreement with the data shown in Fig. 4A. Transrepression of all of the genes tested was abolished in macrophages with no functional LXRs (Fig. 4B). Both LXRα and LXRβ isoforms contribute to transrepression of IFN-γ–dependent responses. (A) Raw264.7 macrophages were cotransfected with Nos2 promoter-luciferase together with a plasmid overexpressing LXRα or LXRβ or an empty vector (pcDNA3). Transfected cells were preincubated with GW3965 or vehicle for 18 h and then stimulated with IFN-γ during 24 h. IFN-γ–induced Nos2-promoter activity was normalized to control Renilla activity; Mean values ± SEM from four independent experiments are represented. **p < 0.01. (B) Macrophages were obtained from WT mice or mice deficient for either LXRα (LXRα−/−), LXRβ (LXRβ−/−), or both LXRα and LXRβ (LXRα/β−/−). The cells were preincubated with GW3965 for 18 h before treatment with IFN-γ (5 ng/ml, 6 h). mRNA levels were determined using qRT-PCR. For each gene, fold change values were calculated using the IFN-γ–treated sample from each genotype as a reference; n = 3 independent experiments. Statistical analysis was performed on normalized relative expression values. *p < 0.05, **p < 0.01. We next analyzed whether IFN-γ signaling leads to changes in the expression of enzymes that participate in the oxysterol biosynthetic pathway. The microarray data from Fig. 1 revealed selective induction of the enzyme cholesterol 25-hidroxylase (Ch25h) (Fig. 5A), which is involved in conversion of cholesterol into the natural LXR ligand 25-HC. This observation was confirmed by qRT-PCR (Fig. 5B). The expression of other enzymes involved in generation of LXR ligands, namely squalene monooxygenase, 24-dehydrocholesterol reductase (Dhcr24), sterol 14α-demethylase/Cyp51, cholesterol 24-hydroxylase/Cyp46a1, and sterol 27-hydroxylase/Cyp27a1, was not upregulated by IFN-γ (Fig. 5A). Because Ch25h is clearly induced during the macrophage response to IFN-γ, we further analyzed whether 25-HC affects the expression of IFN-γ–responsive genes. In general, pretreatment with 25-HC resulted in repression of several IFN-γ–induced genes, although both LXR-dependent and -independent mechanisms were observed (Fig. 5C). Similar results were obtained with the LXR ligands 24,25-epoxycholesterol and desmosterol (data not shown). We also tested whether foam cell formation altered the capability to mount a proinflammatory response to IFN-γ. Macrophages were treated with acLDL and then stimulated with IFN-γ in the presence or absence of the LXR agonist GW3965. The expression of most of the proinflammatory genes evaluated in foam cells was similar to that in control cells, with the exception of discrete downregulatory events such as diminished induction of Cxcl11 and ItgaL expression (Fig. 5D). These observations contrast with the drastic impairment of the proinflammatory response to TLR signaling in acLDL-treated cells (Fig. 5E). Moreover, conversion to foam cells did not prevent the LXR agonist GW3965 from repressing proinflammatory gene expression (Fig. 5D, 5E). Effects of the natural LXR agonist 25-HC on IFN-γ–induced gene expression. (A) The effects of IFN-γ on the expression of enzymes involved in generation of oxysterols were evaluated. Log2-fold changes in IFN-γ–treated versus control samples were calculated from the microarray data described in Fig. 1. CYP27A1, sterol 27-hydroxylase; CYP46A1, cholesterol 24-hydroxylase; CYP51, sterol 14α-demethylase; DHCR24, 24-dehydrocholesterol reductase; SQLE, squalene monooxygenase. (B) Macrophages were stimulated with IFN-γ or PBS for 6 h and the effects on CH25H expression were validated by qRT-PCR. Mean values ± SEM are represented; n = 3. *p < 0.05 versus control cells. (C) Macrophages from WT or LXRα/β−/− mice were preincubated with 25 μM 25-HC or vehicle for 3 h and then stimulated with IFN-γ or PBS for 6 h. The expression of IFN-γ–induced genes was evaluated by qRT-PCR. Results are plotted as log2-fold changes of gene expression in cells treated with 25-HC plus IFN-γ versus cells treated with vehicle plus IFN-γ. Mean values ± SEM from three independent experiments are represented. *p < 0.05 versus WT. (D and E) Macrophages were treated with acLDL (10 μg/ml) or PBS in DMEM/1% FCS for 24 h. The cells were then treated with 1 μM GW3965 or vehicle for 3 h and then stimulated with IFN-γ (5 ng/ml) (D) or LPS (5 ng/ml) (E) for 6 h. PTGS2, PG synthase 2. Proinflammatory gene expression was measured by qRT-PCR. Mean values of normalized relative expression ± SEM from three independent experiments are represented. *p < 0.05, **p < 0.01. We next explored whether activation by IFN-γ plays reciprocal inhibitory effects on the induction of LXR target genes. Macrophages were pretreated with IFN-γ and then stimulated with the LXR agonists GW3965 or T1317. Pretreatment with IFN-γ resulted in diminished induction of Abca1, Srebp1c, and apoptosis inhibitor secreted by macrophages, whereas induction of Abcg1, Idol, and c-mer tyrosine kinase was not inhibited by the cytokine (Fig. 6A, Supplemental Fig. 1A). The inhibitory effects of IFN-γ on ABCA1 expression were confirmed by Western blotting (Fig. 6B). Because ABCA1 mediates cholesterol efflux to apoAI-containing lipoproteins (35), we next evaluated the effect of IFN-γ on macrophage cholesterol efflux to an apoAI acceptor. Prestimulation of macrophages with IFN-γ resulted in reduced cholesterol efflux in response to LXR activation (Fig. 6C), in correlation with decreased induction of ABCA1. Treatment with IL-4, which leads to alternative macrophage activation, or with the deactivating cytokines IL-10 or TGF-β did not inhibit the induction of Abca1 and Srebp1c mRNA mediated by LXR (Fig. 6D), which suggests that the inhibitory effects of IFN-γ on LXR-dependent gene expression are rather specific. The use of macrophages deficient for STAT1 indicated that STAT1 is required for IFN-γ–mediated repression of selective LXR target genes (Fig. 6E, Supplemental Fig. 1B). Because IFN-γ does not inhibit all LXR-dependent responses, we can conclude that the repressive action of STAT1 on LXR targets is probably gene-specific and does not involve interference with general LXR activity. 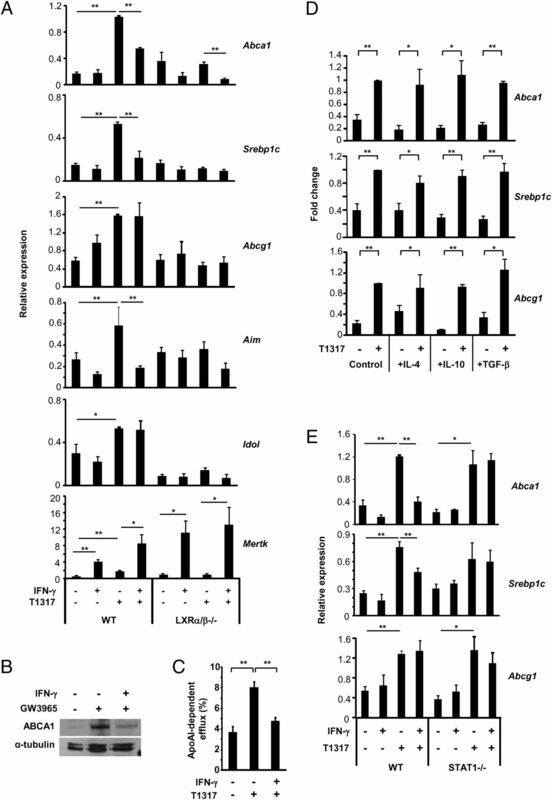 Moreover, LXR-deficient macrophages show derepressed basal levels of Abca1 (Fig. 6A), in agreement with previous data (5). In the absence of functional LXRs, IFN-γ was still capable of downregulating Abca1 expression (Fig. 6A), which suggests that STAT1 interferes with both LXR-dependent and -independent mechanisms of Abca1 regulation. STAT1 activity negatively regulates selective LXR target genes. (A) Macrophages were obtained from WT and LXRα/β−/− mice. The cells were pretreated for 18 h with IFN-γ before the stimulation with T1317 (1 μM, 24 h). Relative expression levels of LXR target genes were determined using qRT-PCR. IDOL, inducible degrader of the low-density lipoprotein receptor. AIM, apoptosis inhibitory factor secreted by macrophages; MERTK, c-mer tyrosine kinase. (B) WT macrophages were pretreated with IFN-γ and then stimulated for 24 h with GW3965. The expression of ABCA1 was determined by Western blotting. The expression of α-tubulin was measured as a control for protein loading and transfer. (C) IFN-γ downregulates macrophage cholesterol efflux to an apoAI acceptor. Macrophages were loaded with [3H]cholesterol-labeled acLDL in the presence or absence of IFN-γ, and cholesterol efflux was measured as described in Materials and Methods. Each point was performed in triplicate and the results are expressed as the mean ± SD. (D) Macrophages were preincubated with either IL-4 (20 ng/ml), IL-10 (10 ng/ml), or TGF-β (2 ng/ml) for 18 h and then treated with T1317 for 24 h. Fold changes in the expression of LXR targets are represented. (E) Macrophages were obtained from WT and STAT1-deficient (STAT1−/−) mice. Stimulations and determination of gene expression were performed as described in (A). In (A), (D), and (E), mean values ± SEM from three independent experiments are represented. In (A)–(E), statistical analysis was performed using a Student t test. *p < 0.05, **p < 0.01. We further explored the mechanisms underlying reciprocal cross-talk between LXRs and STAT1. IFN-γ signaling results in the phosphorylation of STAT1 on Tyr701 prior to STAT1 dimerization and translocation to the nucleus (36) and on Ser727, which contributes to maximal transcriptional activity (37). Western blot analysis demonstrated that LXR activation did not inhibit the phosphorylation of STAT1 at any of these sites during the macrophage response to IFN-γ (Fig. 7A). Regions in the vicinity of GAS elements within the promoters of the chemokines Cxcl11 and Nos2 were used to analyze by ChIP assay the recruitment of total STAT1. IFN-γ promoted the binding of STAT1 to these regulatory regions (Fig. 7B). Interestingly, recruitment of STAT1 was inhibited upon LXR activation (Fig. 7B) despite no effects of LXR agonists on STAT1 phosphorylation. By using a luciferase reporter, we analyzed whether SUMOylation of LXRα or LXRβ was required for repression of the Nos2 promoter. Raw264.7 cells were cotransfected with either WT LXRα, WT LXRβ, or mutant forms of these isoforms lacking two SUMO acceptor sites (LXRα K328R/K434R or LXRβ K410R/K448R, respectively) (31) and a Nos2 promoter-luciferase reporter. Cotransfection of SUMOylation mutants, in comparison with WT LXRs, resulted in significant decrease of the capability of GW3965 to repress the IFN-γ–induced activity of the Nos2 promoter (Fig. 7C), which suggests that SUMOylation of these nuclear receptors is required for LXR-mediated transrepression of IFN-γ signaling. In contrast, downregulation of the expression of the nuclear receptor corepressor NCOR1 by using siRNA technology did not affect the transrepression potential of LXR on the Nos2 promoter (Fig. 7D). LXR activation inhibits STAT1 recruitment to the promoter of selective IFN-γ target genes without affecting STAT1 phosphorylation. (A) Bone marrow–derived macrophages were incubated with IFN-γ for different periods of time in the presence of GW3965 or vehicle. Phosphorylation of STAT1 on Tyr701 and Ser727 was determined by Western blotting. (B) Macrophages were pretreated with GW3965 or vehicle and then activated with IFN-γ for 20 min. STAT1 binding to the promoter region of Nos2 and Cxcl11 was analyzed by ChIP assay. Total STAT1 was immunoprecipitated using specific Abs. Rabbit IgG was used as a control. The presence of specific DNA fragments was determined by qRT-PCR. Mean results of enrichment of STAT1-bound DNA relative to IgG control ± SEM are represented; n = 3. (C) Raw264.7 macrophages were cotransfected with Nos2 promoter-luciferase reporter together with plasmids overexpressing either WT LXRα (left panel), LXRβ (right panel), or the mutant forms LXRα K328R/K434R (left panel) or LXRβ K410R/K448R (right panel). Transfected cells were preincubated with GW3965 or vehicle in DMEM/2% FCS and then stimulated with IFN-γ or PBS for 24 h. The levels of luciferase activity were normalized to those of Renilla activity. Results are plotted as log2-fold changes of relative promoter activity in cells treated with GW3965 plus IFN-γ versus cells treated with vehicle plus IFN-γ. Mean values ± SEM from four (left panel) or three (right panel) independent assays are shown. *p < 0.05, **p < 0.01 versus each respective WT LXR. (D) Raw264.7 cells were cotransfected with Nos2 promoter-luciferase reporter, plasmids expressing LXRα and Renilla, and 1 μM siRNA against NCOR1 (siNCOR1) or GFP (siGFP). Stimulations and representation of the results from duplicate experiments were performed as described in (C). (E) Raw264.7 macrophages were cotransfected with Abca1 promoter-luciferase reporter together with plasmids overexpressing LXRβ and RXRα. To normalize luciferase activity, all cells were cotransfected with a plasmid expressing β-galactosidase. Transfected cells were preincubated with IFN-γ or PBS in DMEM/1% FBS and then stimulated with T1317 (1 μM, 24 h). The levels of luciferase activity were normalized to those of β-galactosidase activity. Mean results ± SD from triplicates are shown. (F) Macrophages were pretreated with IFN-γ and then stimulated with GW3965 for 90 min. The binding of RXRα and LXRs to the regulatory region of selected genes was analyzed by ChIP assay using specific Abs. Unspecific IgG was used as a control. The presence of specific DNA fragments was determined by qRT-PCR and normalized by the levels of β-actin and each respective input DNA. Mean values ± SEM are represented; n = 4. (G and H) Raw264.7 cells were cotransfected with Abca1 promoter-luciferase reporter and plasmids expressing LXRα, RXRα, and Renilla. In (G), 1 μM siRNA against NCOR1 (siNCOR) or GFP (siGFP) was included during transfection. In (H), a plasmid expressing either PGC-1α, SRC-1, or CBP/p300 was included during transfection. Control cells were cotransfected with pcDNA3 instead of plasmids expressing coactivators. In (G) and (H), 24 h after transfection, the cells were incubated with IFN-γ for 6 h and then stimulated with GW3965 for 24 h. Luciferase activity was normalized by Renilla activity, and the results from duplicate (G) or triplicate (H) experiments are plotted as described in (C). *p < 0.05 versus cells transfected with pcDNA3. Conversely, we analyzed the effects of STAT1 activation on LXR-dependent actions. First, the expression of LXR isoforms was not altered by IFN-γ in our conditions (data not shown). By using a luciferase reporter we analyzed whether the inhibitory effect of IFN-γ affected the activity of the Abca1 promoter. In Raw264.7 macrophages, IFN-γ inhibited both basal and LXR-inducible Abca1 promoter activity (Fig. 7E), which indicates that IFN-γ is able to affect the transcriptional activity of Abca1. However, IFN-γ signaling did not interfere with the capability of LXRs or RXRα to bind to regulatory regions containing LXREs on the target gene promoters/enhancers that regulate Abca1, Abcg1, or Srebp1c expression (Fig. 7F). We next assessed whether overexpression of coactivators or silencing of NCOR1 resulted in changes in the capability of IFN-γ to inhibit Abca1 promoter activity. The use of siRNA against NCOR1 had no effect at this level (Fig. 7G). However, overexpression of the coactivator CREB-binding protein (CBP)/p300, but not of steroid receptor coactivator 1 (SRC-1) or peroxisome proliferator-activated receptor γ coactivator 1α (PGC-1α), reduced the inhibitory action of IFN-γ on the Abca1 promoter (Fig. 7H), thus suggesting that competition for CBP/p300 upon STAT1 activation may represent a mechanism that facilitates STAT1-dependent repression of selective LXR targets. Taken together, activated LXRs are able to interfere, in a SUMOylation-dependent and NCOR1-independent manner, with STAT1 binding to selective GAS-containing regions, whereas the mechanism by which IFN-γ/STAT1 results in inhibited LXR-dependent target gene expression and promoter activity does not involve interference with the recruitment of LXR/RXR heterodimers to regulatory regions nor the action of NCOR1. Our data suggest that utilization of specific coactivators, such as CBP/p300, by activated STAT1 is a feasible mechanism that contributes to the inhibitory effects of IFN-γ on specific LXR targets (Fig. 8). Schematic model for the negative cross-talk between STAT1 and LXRs. Based on the results shown throughout this work, we propose a model in which activated LXRs become SUMOylated and are able to interfere with STAT1 binding to specific GAS-containing regions. Induction of the expression of the enzyme cholesterol CH25H and generation of natural oxysterols that partially act through LXRs may represent a mechanism by which IFN-γ keeps its own response under control. In turn, activated STAT1 interferes with LXR-mediated expression by sequestering or compromising the availability of the coactivator CBP/p300 without interfering with the binding of LXR-RXR heterodimers to their target gene promoters. In recent years there has been growing evidence that LXRα and LXRβ exert key inhibitory roles in the control of inflammation (7). Initial studies demonstrated the capability of LXR agonists to transrepress inflammatory pathways activated by TLR3/4 engagement or by treatment with the cytokines IL-1β or TNF-α (12). Recently, LXR agonists were also shown to inhibit the expression of Il6, Tnfa, and Irf1 in IFN-γ–activated astrocytes (13). In this study, we provide an extended view of the global effects of LXR activation on the macrophage response to IFN-γ. Results from gene expression profiling indicate broad inhibitory actions of LXRs on the IFN-γ response, with effects on ∼38% of the genes that are induced by IFN-γ. These effects are comparable to the degree of transrepression that LXR agonists exert on gene expression profiles induced after the activation of TLR3/4 (38). In this study we have used an in vivo model to assess the acute response to IFN-γ in the CNS. Recent studies place IFN-γ as a prime factor in inflammation-induced neurodegeneration (32–34). In correlation with this suggestion, we show that intraventricular injection with IFN-γ results in upregulation of the expression of several chemokines and that pretreatment with the LXR agonist T1317 inhibits their induction. Additionally, we observed similar anti-inflammatory effects in primary cultures of microglia. These cells, in fact, had been previously shown to undergo reduced proliferation in response to LXR agonists (39). Our data are in line with previous observations demonstrating anti-inflammatory roles of LXR agonists in models of Alzheimer and Parkinson diseases (40–42), as well as in models of experimental stroke (43–45). The negative effects on IFN-γ signaling described in this study may well contribute to the anti-inflammatory and neuroprotective actions of LXR agonists in the brain. In our studies, the use of natural ligands for LXRs also served to downregulate IFN-γ–dependent gene expression. Interestingly, IFN-γ signaling induced the expression of CH25H in macrophages, the enzyme involved in the generation of the agonist 25-HC. These observations suggest that induction of CH25H and generation of 25-HC may represent a negative feedback mechanism for IFN-γ to help keep the whole proinflammatory response under control. Of note is the fact that the repressive actions of 25-HC involve both LXR-dependent and LXR-independent activities. While revision of this manuscript was in progress, independent groups reported the induction of CH25H as an antiviral mechanism used by IFNs (46, 47). 25-HC was the only oxysterol generated in response to IFN-γ in macrophages and exerted its antiviral activities at low concentrations through a mechanism that is LXR-independent and that involves mechanisms of interference with the mevalonate branch and viral growth (47). Altogether, induction of CH25H by IFN-γ seems to serve a dual role in macrophages by regulating the inflammatory response to this cytokine partially via LXR and by providing mechanisms of interference with viral growth in an LXR-independent manner. Interestingly, in our studies, conversion of macrophages to foam cells with acLDL resulted in dramatic inhibition of the inflammatory response to LPS, but not to IFN-γ. Recent work demonstrated that peritoneal macrophages obtained from LDLR knockout animals fed with a high-cholesterol, high-fat diet displayed a “deactivated” phenotype, with marked suppression of TLR4 target genes. Induction of several proinflammatory markers by Kdo2 lipid A was also downregulated by in vitro cholesterol loading of macrophages from murine and human origin (48). Our results with LPS-treated cells support these observations, but the fact that the inflammatory response to IFN-γ remains almost unchanged after cholesterol loading is intriguing and may help explain why a considerable percentage of foam cells within established atherosclerotic lesions still display a classically activated phenotype (49). Remarkably, the high-affinity synthetic agonist GW3965 was able to repress IFN-γ–dependent responses in acLDL-induced foam cells, which is in agreement with previous reports demonstrating anti-inflammatory actions of synthetic LXR agonists within the artery wall in vivo (12, 50). In this study we show that both LXRα and LXRβ contribute to transrepression of IFN-γ–induced genes. This contrasts with results showing GW3965-mediated transrepression of the acute phase response in the liver, which was selectively mediated by LXRβ (51). LXR-mediated transrepression has been linked to LXR SUMOylation. In murine macrophages, SUMOylation of GW3965-activated LXRs correlated with prevented clearance of corepressor complexes from the promoter of specific LPS-induced genes (31). In astrocytes, different SUMOylation mechanisms were proposed for LXRα and LXRβ in response to LXR ligands. SUMOylated LXRs formed a complex with STAT1 resulting in inhibited recruitment of STAT1 to the Irf1 promoter during the response to IFN-γ, without affecting STAT1 phosphorylation or its nuclear translocation (13). Despite the fact that we have not been able to demonstrate ourselves the formation of STAT1/LXR complexes (data not shown), our data support a role for LXRs in inhibiting the recruitment of STAT1 to the regulatory regions of selective IFN-γ–induced genes, such as Nos2 and Cxcl11, without affecting STAT1 phosphorylation, and, at least on the Nos2 promoter, LXR-mediated transrepression requires LXR SUMOylation but not the action of the corepressor NCOR1. This observation contrasts with the general requirement of NCOR1 for LXR-mediated transrepression of LPS-induced genes as demonstrated in fetal liver macrophages obtained from knockout embryos (52). We cannot discount, however, that interference with other corepressors may contribute to transrepression in our system. In fact, the corepressor silencing mediator for retinoid and thyroid hormone receptors has been shown to be required for transrepression of a subset of LPS-induced/LXR-sensitive genes, and treatment with IFN-γ resulted in clearance of silencing mediator for retinoid and thyroid hormone receptors from the promoter of some of those genes (52). The work presented in this study also suggests that STAT1 exerts reciprocal negative actions on LXR-dependent gene expression, thus revealing a bidirectional negative cross-talk between both transcription factors. In correlation with negative effects on ABCA1 expression, IFN-γ repressed LXR-mediated cholesterol efflux to lipid-free apoAI. Downregulation of ABCA1 expression by IFN-γ has been previously reported. In peritoneal macrophages, basal ABCA1 expression was inhibited by IFN-γ through a decrease in mRNA stability (53). In THP-1 cells, IFN-γ inhibited the 22-R-hydroxycholesterol–induced expression of ABCA1 indirectly through repression of the expression of LXRα (54). Although we cannot discard effects on mRNA stability, our data indicate that IFN-γ signaling is able to also downregulate the promoter activity of Abca1. Moreover, in our system, IFN-γ did not alter the expression of LXR isoforms and not all the LXR target genes are negatively affected by STAT1 activation, so we cannot conclude that the mechanism to inhibit selective LXR-dependent responses relies on the inhibition of general LXR activity. In our hands, overexpression of CBP/p300 is able to reduce the inhibitory role of STAT1 on the Abca1 promoter in macrophages, which suggests that utilization of a limiting coactivator may be a mechanism by which STAT1 interferes with selective responses mediated by LXR. Previous work reported a similar scenario in which negative cross-talk was established between IFN regulatory factor 3 and LXRs during the macrophage response to TLR3/4 engagement, and competition for the transcriptional coactivator CBP contributed to this phenomenon (55). Interestingly, the fact that other coactivators such as PGC-1α or SRC-1 did not render the same effects than CBP in transfection studies together with the fact that STAT1 differentially affects the expression of Abca1 and Abcg1 makes us raise the question of whether LXRs make a differential use of coactivator molecules on distinct target gene promoters. This is an important issue that deserves attention in future studies. As a general conclusion from the results presented in this study, we can suggest that the bidirectional negative cross-talk between IFN-γ/STAT1 and LXRs has an impact both on IFN-γ–mediated immune responses, as demonstrated in the in vivo model of IFN-γ–induced neuroinflammation, and in the regulation of specific LXR-inducible responses, including ABCA1-mediated cholesterol efflux. It will be interesting to direct future studies to understand the physiological implications of selective downregulation of ABCA1-dependent but not ABCG1-dependent lipid efflux during IFN-γ–mediated acute or chronic inflammation. LXR-deficient mice were provided by Dr. David Mangelsdorf (University of Texas Southwestern Medical Center). STAT1-deficient mice were provided by Dr. Anna Maria Planas (Institut d’Investigacions Biomèdiques August Pi i Sunyer). We thank Dr. Ron Evans for providing the murine Abca1 promoter-luciferase reporter, Dr. Christopher K. Glass for providing plasmids that express SRC-1 and WT/SUMOylation mutants of LXRs, and Dr. Joan Carles Rodriguez for providing PGC-1α– and CBP/p300-expressing plasmids. We thank Dr. Josep Saura (School of Medicine, University of Barcelona, Barcelona, Spain) for help with generation of primary microglia cultures. We thank David Rossell and Evarist Planet at the BioStatistics and Bioinformatics Unit at the Institute for Research in Biomedicine (Barcelona, Spain) for help with the expression profiling analysis. We thank Margarita García, Judit Alier, Marcel Sorribas, and David Santos for technical assistance. This work was supported by Marie Curie International Reintegration Program Grant IRG-031137, Spanish Ministry of Science and Innovation Grants SAF2007-63543 and SAF2010-14989, and Fundació La Marató de TV3 Grant 080930 to (A.F.V. ), as well as by Instituto de Salud Carlos III Grants FISPI09-00178 (to J.C.E.-G.) and 10-00277 (to J.J.). M.P.-G. and L.R. are funded by a fellowship from the Spanish Ministry of Education (National Program for the Formation of University Lecturers); J.M. is supported by a fellowship from the Spanish Ministry of Science and Innovation (Research Staff Training). Centro de Investigación Biomédica en Red de Diabetes y Enfermedades Metabólicas Asociadas and Centro de Investigación Biomédica en Red Enfermedades Neurodegenerativas are Instituto de Salud Carlos III actions. The sequences presented in this article have been submitted to the MIAMExpress database (http://www.ebi.ac.uk/miamexpress) under accession number E-MEXP-3871.
. 1995. The nuclear receptor superfamily: the second decade. Cell 83: 835–839.
. 1999. Structural requirements of ligands for the oxysterol liver X receptors LXRα and LXRβ. Proc. Natl. Acad. Sci. USA 96: 266–271.
. 2006. Sterol intermediates from cholesterol biosynthetic pathway as liver X receptor ligands. J. Biol. Chem. 281: 27816–27826.
. 2010. Retinoid X receptors: common heterodimerization partners with distinct functions. Trends Endocrinol. Metab. 21: 676–683.
. 2003. Promoter-specific roles for liver X receptor/corepressor complexes in the regulation of ABCA1 and SREBP1 gene expression. Mol. Cell. Biol. 23: 5780–5789.
. 2006. Liver X receptors as integrators of metabolic and inflammatory signaling. J. Clin. Invest. 116: 607–614.
. 2011. Liver X receptors as regulators of macrophage inflammatory and metabolic pathways. Biochim. Biophys. Acta 1812: 982–994.
. 2000. Regulation of absorption and ABC1-mediated efflux of cholesterol by RXR heterodimers. Science 289: 1524–1529.
. 2000. Human white/murine ABC8 mRNA levels are highly induced in lipid-loaded macrophages. A transcriptional role for specific oxysterols. J. Biol. Chem. 275: 14700–14707.
. 2009. LXR regulates cholesterol uptake through Idol-dependent ubiquitination of the LDL receptor. Science 325: 100–104.
. 2000. Regulation of mouse sterol regulatory element-binding protein-1c gene (SREBP-1c) by oxysterol receptors, LXRα and LXRβ. Genes Dev. 14: 2819–2830.
. 2003. Reciprocal regulation of inflammation and lipid metabolism by liver X receptors. Nat. Med. 9: 213–219.
. 2009. Differential SUMOylation of LXRα and LXRβ mediates transrepression of STAT1 inflammatory signaling in IFN-γ-stimulated brain astrocytes. Mol. Cell 35: 806–817.
. 2003. High-yield isolation of murine microglia by mild trypsinization. Glia 44: 183–189.
. 1998. Cholesterol and bile acid metabolism are impaired in mice lacking the nuclear oxysterol receptor LXRα. Cell 93: 693–704.
. 2007. Gene-resolution analysis of DNA copy number variation using oligonucleotide expression microarrays. BMC Genomics 8: 111.
. 2001. Creating the gene ontology resource: design and implementation. Genome Res. 11: 1425–1433.
. 1998. The peroxisome proliferator-activated receptor-gamma is a negative regulator of macrophage activation. Nature 391: 79–82.
. 2001. A PPARγ-LXR-ABCA1 pathway in macrophages is involved in cholesterol efflux and atherogenesis. Mol. Cell 7: 161–171.
. 2009. GPS2 is required for cholesterol efflux by triggering histone demethylation, LXR recruitment, and coregulator assembly at the ABCG1 locus. Mol. Cell 34: 510–518.
. 2000. Sterol-dependent transactivation of the ABC1 promoter by the liver X receptor/retinoid X receptor. J. Biol. Chem. 275: 28240–28245.
. 2001. Identification of liver X receptor-retinoid X receptor as an activator of the sterol regulatory element-binding protein 1c gene promoter. Mol. Cell. Biol. 21: 2991–3000.
. 2004. Expression and regulation of multiple murine ATP-binding cassette transporter G1 mRNAs/isoforms that stimulate cellular cholesterol efflux to high density lipoprotein. J. Biol. Chem. 279: 45980–45989.
. 2010. Simple combinations of lineage-determining transcription factors prime cis-regulatory elements required for macrophage and B cell identities. Mol. Cell 38: 576–589.
. 2000. Inducible nitric oxide synthase expression elicited in the mouse brain by inflammatory mediators circulating in the cerebrospinal fluid. Brain Res. 878: 105–118.
. 2007. IFN-γ-induced BACE1 expression is mediated by activation of JAK2 and ERK1/2 signaling pathways and direct binding of STAT1 to BACE1 promoter in astrocytes. Glia 55: 253–262.
. 2005. IL-1 type I receptor plays a key role in mediating the recruitment of leukocytes into the central nervous system. Brain Behav. Immun. 19: 127–137.
. 2007. Parallel SUMOylation-dependent pathways mediate gene- and signal-specific transrepression by LXRs and PPARγ. Mol. Cell 25: 57–70.
. 2012. Interferon-γ plays a role in paraquat-induced neurodegeneration involving oxidative and proinflammatory pathways. Neurobiol. Aging 33: 1411–1426.
. 2007. Involvement of interferon-γ in microglial-mediated loss of dopaminergic neurons. J. Neurosci. 27: 3328–3337.
. 2011. Interferon-γ induces progressive nigrostriatal degeneration and basal ganglia calcification. Nat. Neurosci. 14: 694–696.
. 2008. HDL, ABC transporters, and cholesterol efflux: implications for the treatment of atherosclerosis. Cell Metab. 7: 365–375.
. 1997. The IFNγ receptor: a paradigm for cytokine receptor signaling. Annu. Rev. Immunol. 15: 563–591. 1995. Maximal activation of transcription by stat1 and stat3 requires both tyrosine and serine phosphorylation. Cell 82: 241–250.
. 2011. Liver X receptors inhibit macrophage proliferation through downregulation of cyclins D1 and B1 and cyclin-dependent kinases 2 and 4. J. Immunol. 186: 4656–4667.
. 2008. ApoE promotes the proteolytic degradation of Abeta. Neuron 58: 681–693.
. 2006. Liver X receptor activation decreases the severity of experimental autoimmune encephalomyelitis. J. Neurosci. Res. 84: 1225–1234.
. 2007. Attenuation of neuroinflammation and Alzheimer’s disease pathology by liver X receptors. Proc. Natl. Acad. Sci. USA 104: 10601–10606.
. 2008. Activation of liver X receptors promotes neuroprotection and reduces brain inflammation in experimental stroke. Circulation 118: 1450–1459.
. 2008. Treatment with LXR agonists after focal cerebral ischemia prevents brain damage. FEBS Lett. 582: 3396–3400.
. 2010. Activation of liver X receptor reduces global ischemic brain injury by reduction of nuclear factor-κB. Neuroscience 166: 1101–1109.
. 2013. Interferon-inducible cholesterol-25-hydroxylase broadly inhibits viral entry by production of 25-hydroxycholesterol. Immunity 38: 92–105.
. 2013. The transcription factor STAT-1 couples macrophage synthesis of 25-hydroxycholesterol to the interferon antiviral response. Immunity 38: 106–118.
. 2012. Regulated accumulation of desmosterol integrates macrophage lipid metabolism and inflammatory responses. Cell 151: 138–152.
. 2010. Identification of a novel macrophage phenotype that develops in response to atherogenic phospholipids via Nrf2. Circ. Res. 107: 737–746.
. 2005. Liver X receptor agonists inhibit tissue factor expression in macrophages. FEBS J. 272: 1546–1556.
. 2010. GPS2-dependent corepressor/SUMO pathways govern anti-inflammatory actions of LRH-1 and LXRβ in the hepatic acute phase response. Genes Dev. 24: 381–395.
. 2009. Cooperative NCoR/SMRT interactions establish a corepressor-based strategy for integration of inflammatory and anti-inflammatory signaling pathways. Genes Dev. 23: 681–693.
. 2005. Post-transcriptional regulation of macrophage ABCA1, an early response gene to IFN-γ. Biochem. Biophys. Res. Commun. 333: 596–602.
. 2009. IFN-γ down-regulates ABCA1 expression by inhibiting LXRα in a JAK/STAT signaling pathway-dependent manner. Atherosclerosis 203: 417–428.
. 2003. Crosstalk between LXR and Toll-like receptor signaling mediates bacterial and viral antagonism of cholesterol metabolism. Mol. Cell 12: 805–816.